The Red Sox got just enough pitching...and just enough offense...and finished off the Yankees 4-3 to win the American League Division Series over New York in four games. Rick Porcello did his part with five outstanding innings for the first post-season win of his career, limiting the Yankees offense to one run on four hits. The relief trio of Matt Barnes, Ryan Brasier and Chris Sale did its part with three scoreless, no-hit innings as the bridge to the closer, Craig Kimbrel. And then we all held our breath as Kimbrel meandered his way through two walks, a hit batter, a soft infield hit and two runs to his second save of the playoffs. Boston scored three runs off New York starter C.C. Sabathia in the top of the third on a J.D. Martinez sacrifice fly, an RBI double by Ian Kinsler, and a run-scoring single by Eduardo Nunez. Christian Vazquez lifted a fly ball to right field an inning later that just cleared the short fence to complete the Boston scoring. The surprise relief appearance by Sale was prompted in part by him lobbying manager Alex Cora for three days, telling him that if the right situation arose, he wanted the ball. 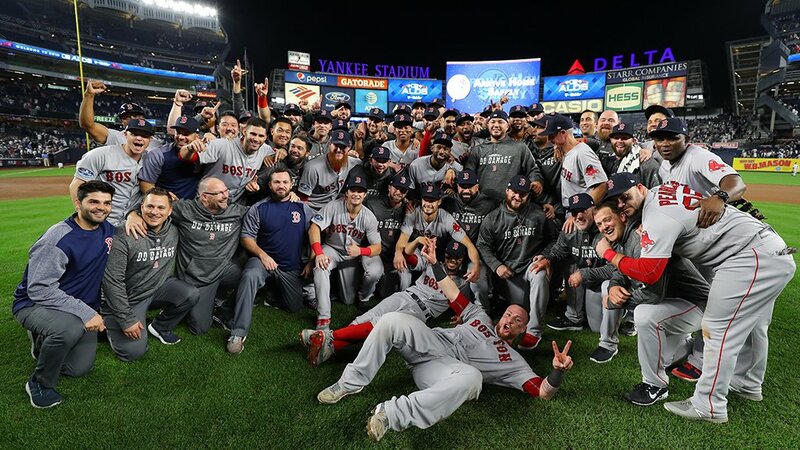 Part of the Red Sox post-game celebration included blaring Frank Sinatra's version of "New York, New York" in the visiting clubhouse, a trolling nod to Yankees right fielder Aaron Judge doing the same following the Game 2 New York win Saturday night.